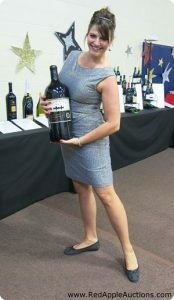 I’ll be working a wine auction later this month in Texas and thought I’d share a wine silent auction idea I witnessed at another event. If you’ve got a lot of wine in your auction, why not have a sommelier onsite to educate guests and “talk up” your packages? 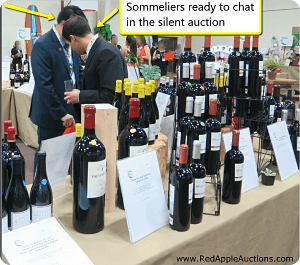 At a school auction earlier this year, one entire silent auction section was devoted to wine. Large formats. Hard-to-find wines. Rare vintages. Some were sold as cases or collections; others were sold as single bottles. Though many of your guests might appreciate wine, that doesn’t mean they are familiar with every bottle they see. Many might be partial to a specific area (“I like Oregon wines.”) or type of grape (“I enjoy a great shiraz.”). But beyond their specific area of personal expertise, they become lost as to what they’d enjoy trying. As an auctioneer, I love educated bidders. Bidders who are confident they will enjoy the wine will bid more aggressively for it. Getting your guests familiar with wines that are unfamiliar to them can pay off for you. They are more likely to pay a premium for those bottles. At the auction I worked, the sommeliers were two professionals. But I’ve known many people who are incredibly knowledgeable about wine who don’t make their living working in the industry. If you’ve got access to a professional who is willing to help you at the auction — great! If not, don’t overlook a passionate hobbyist who knows his way around a wine store. Having a knowledgeable sales rep like this in your silent auction wine section can make a difference in your final bid prices. A word of caution about wines and auctions. Recently British Columbia Liquor Commission issued a directive that single bottles of wine cannot be offered. We can put a bottle of wine in a snack basket however so!!!. Be sure about the rules in your area.